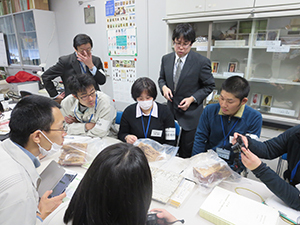 On February 13th, 2017, ten members of the Japanese Association for Conservation of Architectural Monuments (JACAM) visited the TNRICP to improve future conservation and repair techniques as part of the development and training of specialists in the repair of historic buildings. The group toured the Performing Arts Studio, the Library, the Radiography Laboratory, and the Biology Laboratory and received explanations about the work being done in these areas from the researchers in charge. 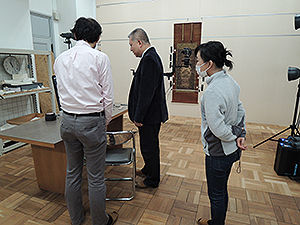 The Department of Art Research, Archives and Information Systems regularly works with the Tokyo National Museum to study Buddhist paintings from the Heian Period in its collection. Each year, high-resolution digital imaging technology belonging to the Tokyo National Research Institute for Cultural Properties is employed to image these works from the 12th century or earlier to gather data that enables researchers to study in greater detail the techniques employed to produce the works. Such data has revealed the use of extraordinary techniques that would not have been apparent with the naked eye. Researchers from the two institutions explore how these techniques were used to create such sophisticated pictorial depictions of Buddhist deities so many centuries in the past. As part of this year’s study, a painting of Cundi (Juntei-Kannon) (Important Cultural Property) and a painting of Samantabhadra (Fugen Bosatsu) (National Treasure) were imaged on February 23rd, 2017 in high-resolution color in sections, along with all of this year’s National Treasure selections. Going forward, other optical study methods will be adopted in this joint work and the results shared with museum researchers so that the place of such paintings in art history can be assessed with an eye toward presenting the paintings to the public in the future. Fujisakae Shrine is located in Minakuchi, Koka City, Shiga Prefecture, the predecessor of which was Yoshiaki Reisha Shrine founded in the early 19th century in order to enshrine feudal lord Yoshiaki KATO, Founder of the family, governing Minakuchi area in the Edo period. The shrine has a variety of treasures, which are said to have been possessed by Yoshiaki. The Western style sword with a black lacquer sheath, which is said to have been granted by Hideyoshi TOYOTOMI, is one of them. Mostly intact in form, this sword is in no way inferior to the rapiers produced in Europe from the 16th to the 17th century. Although it seems to be the only Western sword handed down to the 21st century in Japan, the rapier has been stored at the Minakuchi Museum of History and Folklore in Koka City for many years without attracting much concern so far. 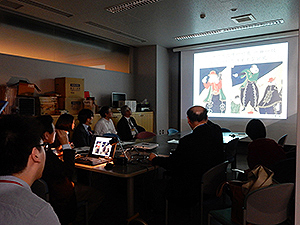 In September 2016, the rapier was investigated from art historical and physicochemical perspectives by the five members of Ms. Akiko NAGAI (Board of Education in Koka City), Mr. Toshihiko SUEKANE (Tokyo National Museum), Ms. Motoko IKEDA (Kyoto National Museum), Prof. Kazutoshi HARADA (Tokyo University of the Arts), and me, Koji KOBAYASHI. The summary and the outcomes of our study were reported at the 10th Seminar Held by the Department of Art Research, Archives and Information Systems held on February 24th, 2017. The presentations made by the members are “Historical Background on the Western Cruciform Sword Stored at Fujisakae Shrine” by Ms. Nagai; “Study of the Substantiality and Age of the Rapier Handed Down to Fujisakae Shrine – Reconnaissance with Museum Collections, Excavated artifacts and eary modern genre paintings” by Kobayashi; “Regarding the Western Sword Housed by Fujisakae Shrine” by Mr. Suekane; “The Western Sword Possessed by Fujisakae Shrine: X-ray CT Scanning and Fluorescent X-ray Analysis” by Ms. Ikeda; and “The Western Sword Belonging to Fujisakae Shrine – Comparison with Overseas Materials –” by Prof. Harada. The outcomes of our preliminary study were presented from diversified perspectives, including the reference to historical backdrops on swords and related artifacts, the study of hilt patterns and production techniques from the viewpoint of the metalworking history, the report of the data obtained through CT scanning and fluorescent X-ray analysis, and comparison with rapiers stored overseas, in addition to topics on Fujisakae Shrine and Yoshiaki KATO. Furthermore, whether this Western sword was produced at home or abroad is an important issue in considering the craftsmanship in the Momoyama period and its historical evaluation. We discussed the issue by exchanging various opinions and views after the presentations, which did not result in any consensus. We recognized the importance of this sword and the necessity of its further research anew. The Japan Center for International Cooperation in Conservation held a lacquerware workshop at the Lacquerware Technology College in Bagan, Myanmar, as part of the project ʻProtection and Conservation of Cultural Properties in Myanmarʼ Bagan is a major production area for lacquerware. The above-mentioned college is working hard to train young lacquerware specialists to pass down local traditions and techniques. A lacquerware museum is attached to the college, where many cultural properties are housed. On the other hand, they need knowledge and skills related to the conservation and restoration of their cultural properties and scientific research on materials. Twelve college teachers and the museum curators participated in the workshop held from February 6th to 8th, 2017. 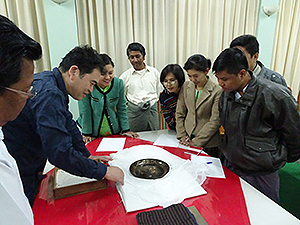 The participants were provided with practical training and lectures on investigation and scientific analysis which are essential for the basis on conservation and restoration of lacquerware. In the practical training, each participant was required to visually examine and take notes on three pieces of Japanese lacquerware and one from the museum collection, followed by a discussion about their uses, materials, techniques and condition of damage. Finally, the comments and explanations were given by the instructor. In the scientific analysis part of the practical training, the participants prepared and observed by themselves cross-section samples. Fragments detached from actual lacquerware were embedded in synthetic resin, and the well-polished samples were then observed using a microscope to understand the structure of the lacquer coating. To cover the practical training, lectures were also provided to introduce a case study of conservation and restoration, along with prevalent methods of scientific analysis. The aim of the workshop was to provide the college teachers and curators with experience that would help them to protect the cultural properties in Myanmar. From February 5th to 28th, 2017, at Me-taw-ya (No. 1205) temple in the Bagan Archaeological Site in Myanmar, the experiments with restoration materials and techniques were carried out in order to establish restoration methods for outer wall of brick temples, mainly aiming at protecting mural paintings from rain leakage. The previous surveys raised the issues to be resolved: the selection of appropriate restoration materials and methods considering aesthetic appearance of the monuments. Repeated discussion with the staff members of the Bagan Branch, Department of Archaeology and National Museums, Ministry of Religious Affairs and Culture of Myanmar, resulted in a meaningful exchange of ideas about concrete restoration methods. On the other hand, explained in detail by local experts, a study was conducted to get the information about the changes of techniques and iconography, related to mural paintings which are the principal subject of this project. During the field work on site, a series of significant damage was detected to the temple structure, caused by the earthquake measuring M6.8 that struck central Myanmar on August 24th, 2016. Consequently, the remedial intervention was taken on the damaged areas, partially rescheduling the first planning. In the Bagan Archaeological Site, obviously rain leakage is the crucial cause of deterioration of the brick temples and mural paintings which decorate their inside. 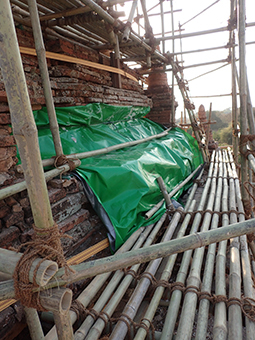 Lashing belts were employed to reinforce the structure, along with nets and waterproof sheets to prevent collapses and water penetration, taking into account the approaching rainy season. The results of chemical analysis of various materials used during the construction period will provide the criteria for revising the restoration methods introduced in the past and for studying the compatibility between new and old materials. Also, a plan will be made with local experts for new restoration methods adapted to the current situation of the Bagan Archaeological Site. 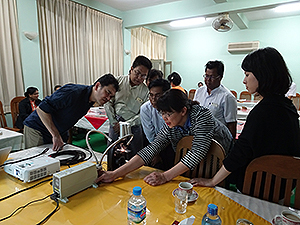 Myanmar, Thailand, Cambodia, Vietnam and Japan made presentations on the developments on this field in each country, shared information and exchanged opinions. In their presentations, the lecturers explained the different efforts being carried out in each country in order to determine the features of already lost wooden buildings from the remaining archaeological evidence. In Myanmar, large postholes shaped as wells and surrounded by bricks have been unearthed at the Bagan Royal Palace site. 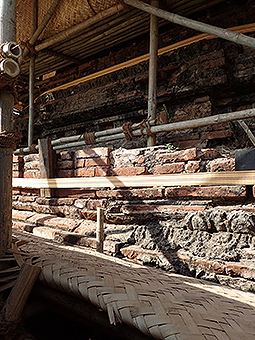 In Thailand, foundation stones, unearthed roof tiles, and traces of wooden members remaining in masonry walls and pillars have been used as hints to deduce the features of the wooden posts, walls and roof structures that existed in the sites of Sukhothai and the Phitsanulok Royal Palace. In central Vietnam, foundation stones, ornamental eave-end tiles and burned wooden members have been excavated from several Lin Yi sites, and reconstruction proposals of wooden structures have been developed on the basis of postholes found at the Champa site of My Son. Regarding northern Vietnam, the features of the foundation works and unearthed roof tiles at the Thang Long Imperial Citadel site were introduced, and a comparative analysis between earthenware architectural models and existing ancient buildings was made. A question and answers session was held after each presentation, and at the end of the seminar a panel discussion with the participation of all the presenters was held, including the Japanese approach among the discussion topics. 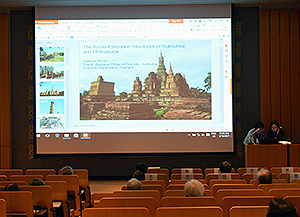 The results of the fruitful exchange of information carried out during this seminar will serve as a basis for future cooperative research efforts, directed at furthering the understanding of the wooden built heritage of Southeast Asia.